Last Week in Review: Key reports and remarks lead to a volatile week in the markets. Forecast for the Week: Housing news dominates a holiday-shortened week. View: IRS standard mileage rates shift downward in 2017. “What are words for when no one listens anymore?” Missing Persons. Housing numbers, Retail Sales and inflation data told quite the tale, while words from the Fed chair also caught people’s attention. In housing news, Housing Starts slipped in January but still beat expectations. The Commerce Department reported Housing Starts declined 2.6 percent in January from December to an annual rate of 1.246 million. 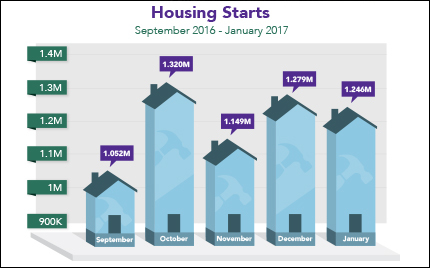 However, Housing Starts were up 10.5 percent from January 2016. In addition, Building Permits were 4.5 percent above December’s figures. New Housing inventory that is in the works or being planned will be a welcome sign to homebuyers. Retailers enjoyed a solid January as consumers seemed more upbeat about the economy. Retail Sales rose 0.4 percent, above the 0.2 percent expected, while the December reading was revised higher, per the Commerce Department. From January 2016 to January 2017, Retail Sales were up 5.6 percent. Inflation on both the consumer and wholesale sides was also hotter than expected in January, with the wholesale-measuring Producer Price Index (PPI) reaching its highest reading since the fall of 2012. Of note on the consumer side, year-over-year Consumer Price Index rose to 2.5 percent. Year-over-year PPI remained unchanged at 1.6 percent. Rising inflation decreases the value of Bonds, like Mortgage Backed Securities. This, in turn, can have a negative impact on home loan rates, which are tied to Mortgage Bonds. While Mortgage Bonds reacted negatively to the hot inflation and robust economic data, it was the words of Federal Reserve Chair Janet Yellen that really set markets in motion. Yellen caused a stir early in the week when she said it would be “unwise to wait too long to hike interest rates,” referring to the Fed Funds Rate. This is the rate at which banks lend money to each other overnight. Her remarks revved a record-setting Stock rally at the expense of Bonds, though Mortgage Bonds rebounded later in the week. Despite the volatility, home loan rates remain in historically low territory. Housing news will be the bookends of a short week. Markets are closed Monday in observance of Presidents Day. In housing news, Existing Home Sales will be released on Wednesday followed by New Home Sales on Friday. Thursday brings the usual weekly Initial Jobless Claims. The Consumer Sentiment Index will be shared on Friday. As you can see in the chart below, Mortgage Bonds have rebounded in recent days. Despite recent volatility, home loan rates are still in attractive territory. If you drive a car, truck or van for work, you’ll want to know the standard mileage rates the IRS has set for 2017. These rates are used to calculate deductible costs for driving an automobile for business, medical and moving purposes as well as driving for charitable purposes. The IRS provides the standard mileage rate for ease and convenience only. If you prefer, you may calculate the actual costs of using your vehicle for work instead of using the standard mileage rates. Check to see which saves you the most! Before you calculate your deduction, make sure you qualify. Connect with your local tax preparer for requirements as well as to learn the most effective means for tracking mileage throughout the year. Please feel free to pass this important information along to your team, clients and colleagues.